It’s been two years since Dear Hubby has gone hunting. Two years ago, he had the flu and was too sick to go. He tried to go last year but became quite ill and had to come home before hunting season even began. You see, last year his pain management doctor had put him on Fentanyl patches for his MS pain. Little did we know that those patches were faulty at the time and were later recalled. He almost died from a cumulative overdose. To say that it was frightening would be an understatement. He loves to go hunting and I do hope that this isn’t his last year for it. His gait is poor and he tires easily. If he wasn’t with his best friend, I’d be worried. However, I know his friend will look after him. They’ve been friends and hunting partners since Junior High. DH doesn’t trophy hunt. He hunts to put meat on our table and when he gets a deer, it saves us a great deal of money at the grocery store. In the meantime, the pups and I are keeping each other company. There’s nothing quite like having two 65 lb BTs join you on your lounge chair. I’m that squished bit under the two dogs. I know these pictues have made the rounds already this year. I can’t help it, I laughed like a fool and passed them on. 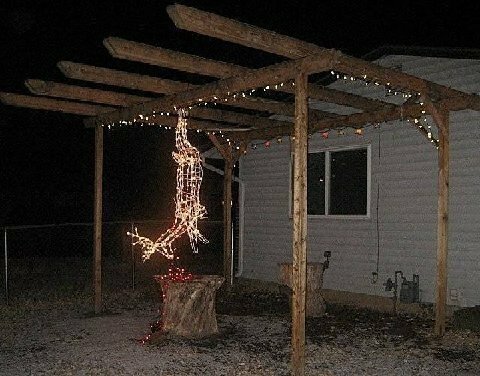 Maybe I’ll put up some lights this year after all–these gave me a few ideas. Hehehe! 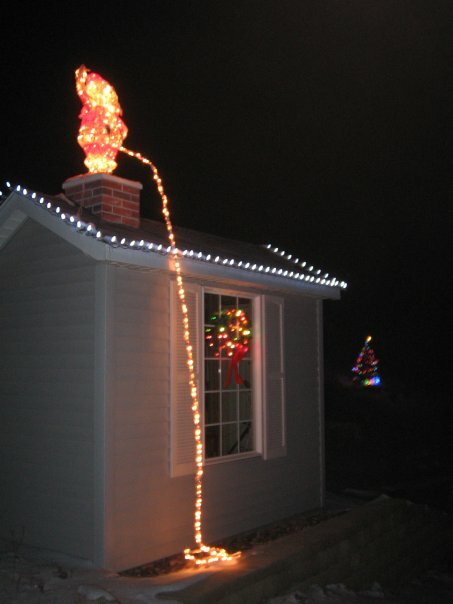 Once again, I was disqualified from my neighborhoods"Best Decorated House" contest due to my bad attitude! This may offend some people but it cracked me up! I took giant steps to keep up with his military pace. His warm hand engulfed mine. When he smiled the skin around his eyes crinkled and his laughter was a wonderful thing to hear. His scent was cigarettes and Old Spice. He enjoyed practical jokes, had a great sense of humor, and loved his family with a fierce devotion. He could tell a story better than anyone I knew. His voice could fill a room. He was down to earth, honest, and never forgot where he came from. Fourteen years he’s gone and I can still hear his voice, remember his scent, his warmth, and his love. Dear Hubby and I will be staying close to home. As in, we aren’t going anywhere today. DH will sit in his lounge chair and watch TV with Patty. Gavin will snooze in his chair. Yes, Gavin has his very own chair. It’s behind my desk chair so he can be close but not trying to get on my lap while I work. What will I do? Between running the dogs out whenever they decide that they must go. (Yes, the dogs are in charge.) It’s a perfect day to curl up with a good book—or write one. I look forward to a full coffee pot and meals on paper plates so there are no dishes for me to do. I spent too many years in retail to consider going anywhere near a store today. I no longer have the patience to deal with rude people, imbeciles, and screaming lunatics. If we’re extremely lucky, the neighbor’s idiot kid won’t spend the afternoon gunning his car for hours on end and we’ll have a quiet day. They rent, we’re looking forward to the day they move. In fact, when that happens we’ll have a party to celebrate. When the table groans under the weight of the food on it—it must be Thanksgiving. When everyone (even Grandma) loosens his or her belt six notches after the meal—it must be Thanksgiving. When you’ve cooked for twelve hours to serve a meal that is scarfed down in mere minutes—it must be Thanksgiving. When the choices for dessert exceeds that of the dessert menu at the local gourmet restaurant—it must be Thanksgiving. When you stop and take the time to count your blessings—it must be Thanksgiving. I’ve been trying to cut back on my coffee drinking. I used to drink herb teas quite often, but haven’t for a long time. I’ve discovered Bengal Spice tea made by Celestial Seasonings. Dang, it’s good. They have a few other flavors, I didn’t see in the store I went to, that I’m going to try to find at another store. I still want my coffee but their teas make a nice, flavorful change especially before I go to bed. Dear Hubby likes their Sleepytime Vanilla tea and their Cinnamon Apple Spice. I do think the Sleepytime Tea has been helping him sleep better. Do I have a magnet in my pocket? Ladies, when your Dear Hubby retires, pray he finds something to do. I can’t cook dinner without DH coming into the kitchen and getting under foot. He’s worse than the dogs! Five minutes earlier, when I was nowhere near the kitchen. Did he need to get into the cupboard then? Nope. As soon as I begin to cook dinner, he needs something from the cupboard above or below where I’m working. Or, he blocks my access to the sink because he’s there fiddling with something. It’s as if I have a magnet in my back pocket. Of course, the dogs compete with him over getting under foot, but at least I can chase them out of the kitchen and pull the baby gate across. It’s a shame the gate doesn’t work on him. Don’t get me wrong I love DH dearly, I love the dogs too but geez, let me get dinner without having to trip over someone. Please. It’s an accident looking for a place to happen because I’ll be the first to admit it—I’m a KLUTZ! Is setting that important? Today it isn’t as important as it was way-back-when. Long descriptions will put today’s readers to sleep. However, one does need to create a believable world. The old writers took pages to describe the setting. Today, with less patient readers, we need to nail it in a paragraph or less. A Sci-Fi writer has a difficult task and, at the same time, a simpler one, creating his/her world than a mystery writer does. He/she can invent weapons, creatures, and forms of transportation his/her way and if he or she can suspend disbelief, no one takes them to task. Try using a weapon incorrectly in a mystery or suspense book. You’ll have people crawling out from everywhere screaming, “On page such and so, you had the antagonist fire this weapon wrong. You should have….” Get the idea? We have to be careful when we construct and create. Research everything, get the details right. Give me dialogue anytime. I can write great dialogue. I can write dialogue standing on my head, or with one hand tied behind my back. On the other hand, when it comes to setting, I struggle. I was all set to to do a light hearted post tonight. I even had the basic idea for it jotted down. Then I spent several hours today doing something I shouldn’t have had to do. I had to scrub our side fence. Why? Because some #@%%*!! idiots tagged it. I just thank my lucky stars that they were reaching the end of their spray paint can when they got to our fence. However, one of the freaking brats decided to use some sort of pen on one of the main posts. They laid the ink on thick and it took me longer to remove than the damned paint. Remove it, I did. There’s no sign of ink or paint left out there. I’m angry. Angry that people are no longer taught to have respect for other people and their property. Angry, that I didn’t catch the little s***s in the act so I could shove their paint cans and teeth down their throats. Tag, you’re freaking it. It would’ve been worth the jail time. I need to hit the lottery. I want to move. When I move I will only give my address out to people I love and trust. That way we won’t have certain people popping in on us that, we’d rather never see again. As if, they’d bother anyway. Is it me or are the TV commercials getting worse? It’s bad enough when we’re assaulted by one bad erectile dysfunction medication commercial after another, but now it’s Christmas shopping commercials. Does anyone else find that blond lady on the Target commercials downright psycho? She’s enough to give you nightmares. And don’t get me started on the mannequin with her jazz hands. Give me cute. Like the Armstrong Floor commercial with the skate boarding Bulldog. Give me snappy and witty but please don’t tell me to have a happy period. If Mother Nature ever showed up here to hand me a ‘present’, I’d slap the crap out of her. It’s no wonder parents go broke at Christmas. Little Johnny and Janie are inundated with commercials for expensive toys they must have! Excuse me, but what child NEEDS a $30.00 cell phone? Children lose things! Heck, they lose mittens that are strung through their coat sleeves around their necks or hermetically sealed to their coat cuffs. Guaranteed you’ll be hearing about how they lost that phone within a week. You might as well go flush the money down the toilet, or go lose it at the gambling tables. It all amounts to the same thing. There are no limits to the insanity. Writer’s Digest Books puts out tons of fantastic books for writers. Right now, I’m making heavy use of Lee’s book and one written by Hal Blythe, Charlie Sweet, & John Landreth, Private Eyes a writer’s guide to private investigators. Also, thank heavens, I have to two real life PIs I can use as resources. One of them I met at a writer’s conference and the other one Dear Hubby knows. Not everything I write comes from books. I do check my facts with the real McCoys. Both of the books I’ve mentioned are from Writer’s Digest Books Howdunit Series. They also put out The Elements of Fiction Writing Series and the Behind The Scenes series. I think I’m missing one or two from that last series. Hmmm, I think I need a shopping list. Bath day for the pups…Oh no! I dread it. Gavin and Patty are long over due for baths. Why? Because every time it’s a struggle to bathe them. Well, the bath itself isn’t the struggle. It’s getting them to the tub. Take Gavin, he will do anything for a cookie except follow you upstairs. He hates baths. He knows all the signs that there’s a bath in his future. He knows that if you are on the stairs offering him a cookie this is not a good sign. If you’ve taken the dog towels from the basement laundry to the bathroom, he knows someone is getting a bath. He hopes it is Patty. It isn’t, he goes first. I put a leash on him, fill my pocket with cookies, and spend 15 minutes coaxing him upstairs and into the tub. Once he’s in the tub, things go fast. He’ll sit in the middle of the tub with his ears flattened to his head but he doesn’t fight it. Once the bath is over with, he loves the drying part. Then he dashes downstairs to pounce on DH and show him how clean he is. I think he also tells Patty that she’s next. Neener neener neener. Ah, Patty. Patty weighs 65 lbs, as does Gavin. She hates, hates, hates getting wet. She makes bathing Gavin easy. When she gets wind of a bath in her future, she hides in the back of her crate. There aren’t enough cookies in the world to convince her that a bath is a good thing. Have you ever tried to pry a 65 lb, stiff legged, dead weight dog out of a crate? It isn’t easy. Nor is it easy to drag that stiff legged, dead weight dog up a steep flight of steps, into the bathroom, and lift her into the tub. Whereupon she goes into her ‘you hate me, poor pitiful me’ act as soon as the first drop of water hits her. Meanwhile Gavin giggles downstairs because he’s already had his bath and has a tummy full of cookies.